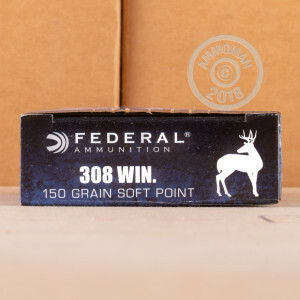 Federal Power-Shok hunting ammunition scores high on both cost and terminal effectiveness! 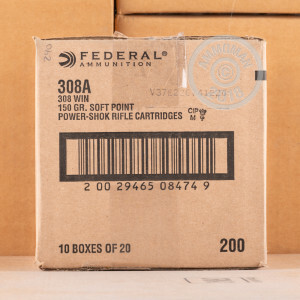 Each .308 Winchester cartridge in this box of 20 fires a tried and true 150 grain soft point bullet at a muzzle velocity of about 2,820 feet per second, delivering excellent long-range accuracy for those tough shots on deer and other game. Soft point bullets are ideal for hunting due to their ability to expand and incapacitate an animal without fragmenting and destroying edible meat. 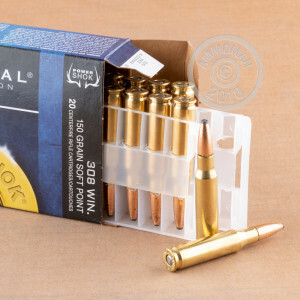 This ammunition is manufactured in Anoka, MN using non-corrosive Boxer primers and brass cases.